, Remove a +1/+1 counter from Fertilid: Target player searches his or her library for a basic land card and puts it into play tapped. Then that player shuffles his or her library. 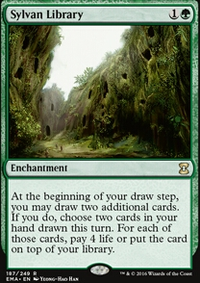 Totally disregarding lands, I'd cut: Everything Gus suggested, and Warstorm Surge , Wolf of Devil's Breach , Lord of Extinction , Grave Sifter , Counterspell (depending on how good your mana ends up being), Pull from Tomorrow , Urban Evolution (I think you want your ramp/draw to elemental-based, more efficient, or fix your mana), Titanic Ultimatum (take what I said about Counterspell and bring it up two levels), Conflux . Update: I made some upgrades to make the deck a little more combo-y. Mostly, woodfall primus for a MLD wincon (after the deck has locked out all opponent's creatures, time to start blowing up all the rest of the non-creature permanents to secure a grind-y win). Really happy with how the deck plays - off to a slow start but able to keep threats in check and ramp up to a ton of resources. The budget tutor suite seemed fairly effective. I think I might need even more green sources - early ramp is so clutch. Kindof worried about white basics, white seems the least critical component but there are a lot of double white cards. 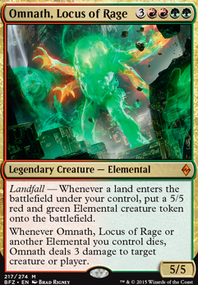 Most of my decks are very commander centric - I really like that this one feels like in no rush to get out the commander on curve. 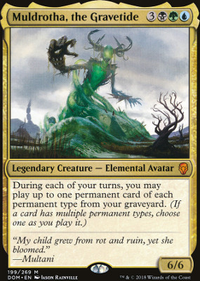 Oversold Cemetery is straight up value - play it on curve and you will always have extra resources coming back to your hand with cards like Sakura-Tribe Elder , Fauna Shaman , and Fertilid . 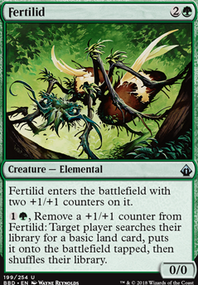 Works like a second Phyrexian Arena at a lower mana cost no less! Coolest part of this homebrew was that apart from buying the commander on a whim I just happened to have all the rest of the 99 cards in my collection already. And all I wanted to smash bad BW tokens and BG token decks together to make something 3 color that would have access to more card options. I would love to add in a Dryad Arbor as a reason to include my Green Sun's Zenith . I could also see adding The Gitrog Monster since he would be fetchable. I am not really looking to raise the CMC much more, but he looks like so much gross value with the draw and with Life from the Loam . Since you're running green i would suggest taking out Burnished Hart and Solemn. THrow in Kodama's Reach and Skyshroud Claim . Put in Beast Within for Slice in Twain . Chromatic Lantern . Cut gilded lotus and darksteel ingot. I think your deck has an identity crisis so I would cut the non-counter themed cards. I would add in Anafenza, the Foremost , Biogenic Upgrade Incubation Druid Forgotten Ancient Hardened Scales Champion of Lambholt Inspiring Call . Scavenging Ooze Pir, Imaginative Rascal Juniper Order Ranger Loyal Guardian Shalai, Voice of Plenty . Mycoloth Fertilid .